Carburetors are responsible for mixing air with fuel to obtain the correct ratio for a combustible vehicle’s engine. The carburetor also helps to control the engine’s speed when the gas pedal is pressed. However, you don’t hear much about carburetors in cars too much these days, with the advent of fuel injected engines. But, that doesn’t mean they’ve gone away completely. You’ll still find carburetors on small engine machines, like your lawn mower, rototillers, and other such equipment. That leads us to question, what’s the function of a carburetor and what is the difference from fuel-injection? 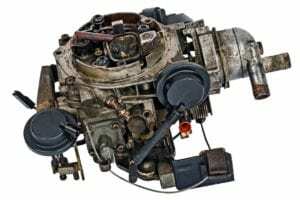 The carburetor is a pipe above the engine cylinders with an air pipe and a fuel pipe connected to it. The air pipe brings in outside air, first through an air filter to remove dirt and other debris, and then to the carburetor. The carburetor, also known as the carb, has two valves that perfect the air to fuel ratio. The first valve, known as the choke, regulates air flow into the carburetor to mix with the fuel and is only used when the engine is cold. The second valve opens and closes when you depress the gas pedal and regulates how much of the combination exits the carb and goes into the engine. As the valve opens it draws air by the venturis and pulls fuel in to mix with the air. Fuel is provided via a small fuel tank called the float-feed chamber or float bowl. As fuel in this tank decreases, the float falls, which opens a valve at the fuel inlet pipe to refill or maintain the fuel level in the tank. If you’ve ever heard of a vehicle running too rich or lean, this is because the air to fuel ratio is unbalanced. When there is too much air to fuel, the engine will burn lean. Contrarily, when the fuel to air ratio is off, the engine burns rich. When the engine is burning lean, the vehicle achieves better fuel economy, while rich burning produces a better performance. While either of these situations may seem ideal, having too little or too much air is bad for the engine. The only time a rich mixture is acceptable is when the vehicle is firing from a cold start. Pressing on the gas pedal allows the valve to open to let more air in permitting more gas to be mixed, increasing the vehicle’s speed. Once the vehicle reaches a cruising speed, the mixture can return to a leaner, more fuel-efficient state. Back in 1888, when the first carburetor was invented by Karl Benz, founder of Mercedes, it was a brilliant development for the automobile industry and was a process used for nearly a century. Yet, as better technology emerged, carburetors were replaced with fuel injection systems in modern vehicles. Though fuel-injected engines were introduced in the early 1900’s, the automotive industry did not apply the technology until the early 1980’s when the engine computer gained popularity. Early fuel-injection systems were referred to as throttle-body injection, central fuel injection, PGM-CARB, or EGI systems. 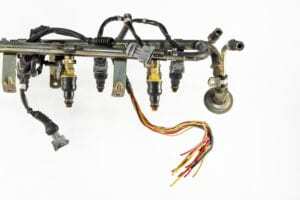 Fuel-injection systems possess a computer that controls the fuel injectors, the past systems sprayed the fuel directly into the air that is entering the intake manifold area of the engine, the new way is to spray fuel directly into the cylinders. In order to obtain the correct ratio of air to fuel, a mass air flow (MAF), a throttle position sensor, coolant temperature sensor, manifold absolute pressure, and oxygen sensor is required. Fuel comes directly from the fuel tank with the use of the fuel pump, with pressure controlled by the fuel pressure regulator. The fuel-injector’s job is in its name! Using pressure, it injects the fuel mixture into the combustion chamber during a specific moment during the piston cycle. Along with the sensors and the computer, the fuel-injection system gives the best and most accurate control of the fuel and air mixture. Additionally, fuel injection provides a smoother and more consistent response from the throttle, easing cold starts, and improving fuel efficiency and ambient temperature fluctuations.